If you were born between 1945 and 1965, you are by definition a Baby Boomer whether you admit it or not (the exact start and finish of a generation is not universally defined, but the consensus is that each generation lasts about twenty years, though people at the beginning or end could likely fit into the generation that precedes or succeeds it). Yet contrary to the Boomer-centric publishing industry (or television, radio, movies or any other media outlet within their control) of years past, today Baby Boomers are no longer most of the authors, readers or publishers anymore, which means that's no longer a Boomer pep rally as it previously was (indeed, the publishing industry is struggling somewhat these days, which means that today, publishers more likely make decisions on what to publish based on what will actually sell). It began when a venture capitalist questioned why technology hadn't improved as fast as it did previously (leading to slow economic productivity growth, listen/see http://bit.ly/2imEfHQ for more detail), or the recession lasted longer and saw a weaker recovery, and all of his research suggested that Boomer behavior and the economic/political policies implemented under their watch was largely responsible. 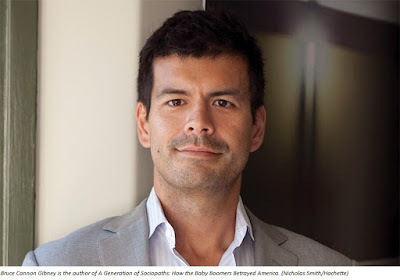 In that environment, Bruce Cannon Gibney, who is a 40-something Gen Xer (he was born in 1976), has published a new book entitled "A Generation of Sociopaths: How the Baby Boomers Betrayed America". He says the Boomer attitude of "Me first and damn the consequences" has been a disaster for the country. In short, He posits that too many Boomers are selfish, lacking in empathy and financially irresponsible and its been a disaster for the U.S. economy. Known as the "Me Generation," the Baby Boomers have long been described as self-interested, but never quite in such damning terms. "My assertion isn't that all Boomers are sociopaths, but that a sufficiently large percentage of them behave in ways that appear to be sociopathic and because they're such a large generation ... any personality defects could easily translate into political dysfunction. I think that is what happened." Suffice to say, Mr. Gibney's new book is making headlines not only because of the provocative title, but because he uses a lot of verifiable facts to validate his central thesis that as a whole, the Baby Boomer generation have some sociopathic tendencies, and they have undermined the prosperous, progressive America they were raised in. He uses credible statistics to show how Baby Boomers have turned American dynamism into stagnation, inequality, and bipartisan fiasco. Perhaps not surprisingly, Bruce Cannon Gibney has also been getting a lot of angry mail since his new book, "A Generation of Sociopaths: How the Baby Boomers Betrayed America," came out in early March 2017. Of course, a lot of that correspondence is still snail-mail paper letters, since Boomers tend not to e-mail as instinctively as subsequent generations do. Still, he has wisely not published his own e-mail address, just in case. Men's Journal had an interview with Mr. Gibney at https://bit.ly/2Vne7kQ which is worth reading. Also, the Boston Globe interviewed him which can be seen at http://bit.ly/2l9KXCA. Similarly, WBUR, which is Boston's NPR news station had an equally interesting radio interview with him. The central thesis is not Baby Boomer narcissism or sociopathy per se (he doesn’t claim to be a psychiatrist who can diagnose anyone), but the tendencies of the generation as a whole have failed to save for their own retirements as they should have, and are therefore are over-reliant upon their own children. As proof, he notes that we see this in the national data based on cohort savings levels and national savings levels, for which there have been in significant declines in savings rates since the 1970's when the Baby Boomer generation first entered the workforce. Beyond that, he also cites data that supports the claim that Boomers have largely failed to support public policies that maintained critical infrastructure on things like roads, airports, schools and the like, putting future generations at a disadvantage relative to the environment Boomers grew up in, which he claims is sociopathic behavior. "I don't posit that all Boomers are sociopaths, just that a large fraction of them are," Mr. Gibney said. "The study done by the National Institutes of Health speculated in the '80s that the consequences [of Boomer behavior] would get worse over time, and I think it has," said Gibney. Raised in an era of seemingly unending economic prosperity with relatively permissive parents, and the first generation to grow up with a television, Baby Boomers developed an appetite for consumption and a lack of empathy for future generations that has resulted in unfortunate policy decisions, argues Mr. Gibney. "These things conditioned the Boomers into some pretty unhelpful behaviors and the behaviors as a whole seem sociopathic," he said. "Prior generations did not divorce frequently, in substantial part because no-fault divorce wasn't around until '69. But the odd thing is that the Boomers actually have higher rates of divorce than even their children at comparable points in the marriage. So their rates of divorce are lower. And that's relevant not because divorce is a moral good or bad, per se, in any given situation, but because one of the key sociopathic indicators is an inability to form a lasting relationship, and I think divorce certainly falls into that category." Canada's MacLean's magazine covered it from a non-American perspective, which some have equated to being the equivalent the U.S. magazine Time or Britain's Economist, and that can be viewed at http://bit.ly/2m1nHvK. 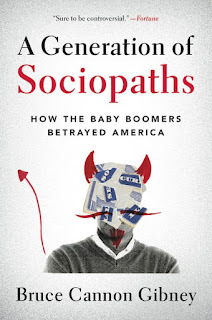 "A Generation of Sociopaths: How the Baby Boomers Betrayed America" is an important work because it systematically dismantles many of the claims that Baby Boomers have made for the past several decades. He also argues that several hallmarks that Boomers have attributed to themselves are simply them taking credit for the work of others. He notes that it's time that we dispense with this meretricious Baby Boomer rebranding that's gone on. For example, items Baby Boomers like to give themselves credit for, such as the Civil Rights Act of 1964 did not occur because Baby Boomers decided to protest, rather that legislation was passed into law by their parents. He also notes that Brown v. Board of Education was not decided by 14-year-olds, and that would have been the oldest Baby Boomer at the time. It was decided by nine old, white men on the U.S. Supreme Court. The Clean Air Act that was passed in 1963. Again, that's not a Boomer victory either. Although his core thesis is negative, it's probably not completely unexpected. Gen X has been told by Baby Boomers for its entire existence that there would never, ever be a generation as 'great' as the Baby Boom was (although now we have the Millennial generation which not only outnumbers Baby Boomers, but will eventually surpass them in votes, too). 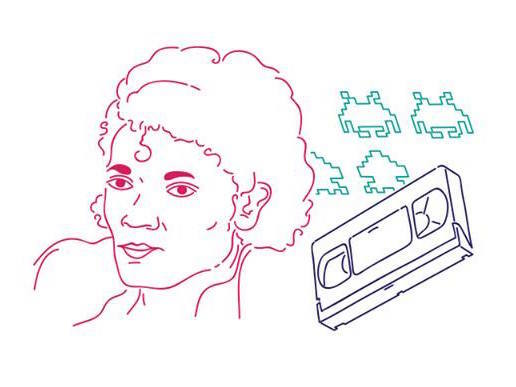 Gen X was also force-fed Boomer music, movies and television for decades. But keep in mind that Gen X fought Baby Boomers over our name, as many Boomers wanted to call Generation X (unoriginally) "Baby Busters", but we know how that turned out. Similarly, Millennials followed the same path and rejected the labels "Gen Y" and "Boomer Babies" for a label that's better suited to them. As a result, there is deep-seated resentment of the Baby Boomer generation, especially among the generations that follow. As a result, they don't always write glowing endorsements that Baby Boomers have grown accustomed to. Forbes does suggest that Gen X seems destined to assume political power in the not-too-distant future due to no other reason than demographic reality (see http://bit.ly/2n1HQ4d for the article), and Politico suggests (see http://politi.co/1K9zu1t for the article) that the country as a whole will likely be better off once Gen X assumes political power in Washington, DC. But Boomers have been slow to relinquish power, perhaps to ensure that they keep policy benefiting them as long as possible. Bruce Cannon Gibney does say "I do have hope [for the future]. Young people do seem to embrace an empathetic agenda, up to and including supporting senior entitlements, I think in part because they've been misled about it. They're certainly much more progressive about climate change and civil rights than the Boomers are. So I am hopeful, but it will be some time before they're in control. The Boomers still hold 69% of the House. They're obviously in the White House for some time. Whether that's four more weeks or eight more years remains to be seen. And they control substantial chunks of the judiciary and the administrative state. So we are going to be living in a Boomer America for some time, in part because the policies themselves will carry forward for some time."